220 x 220 x 240mm printing volume：220 x 220 x 240mm printing volume, just right for you.Made from piano-black laser-cut acrylic frame. To maintain the garage-built feel and the handmade charm. support ABS / PLA / Wood / Nylon PVA / PP / Luminescent：Multiple 3D printing filament supportable, support ABS / PLA / Wood / Nylon PVA / PP / Luminescent. 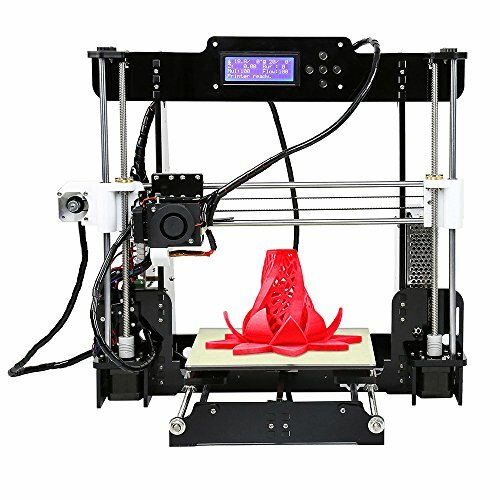 Unassembled DIY kit：It is unassembled DIY kit, provide you an unforgettable step-by-step learning experience of 3D printer from scratch. As long as you have a passion for creativity, you can not afford to miss this product. Operating system&Working environment：Windows XP / Windows 7 / Windows 8 / Windows 10 /Mac / Linux. Temperature: 10 - 30 Deg.C, humidity: 20 - 50 Deg.C. Widely used：Suitable for a wide range of customers, young or old, professional or amateur etc. Noted：1.There is no instruction in the package,detailed installation instructions in the SD card. 2.Do not place flammable objects near the printer during use the printer.